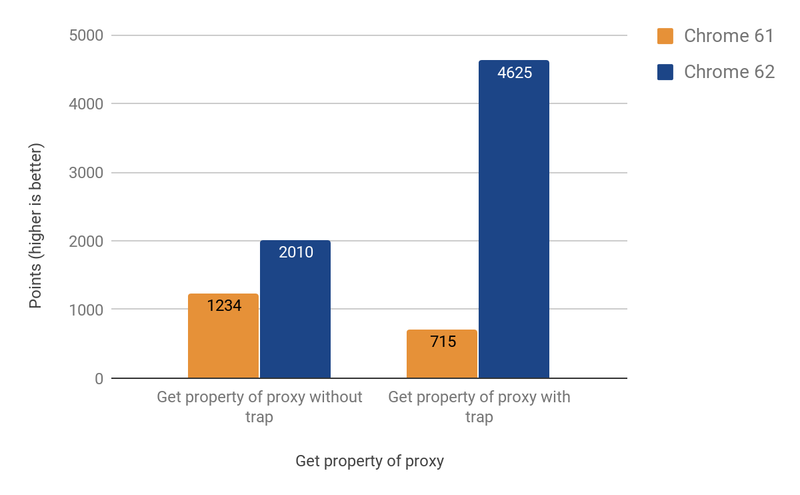 The first feature we’ll focus on is the construction of proxies. 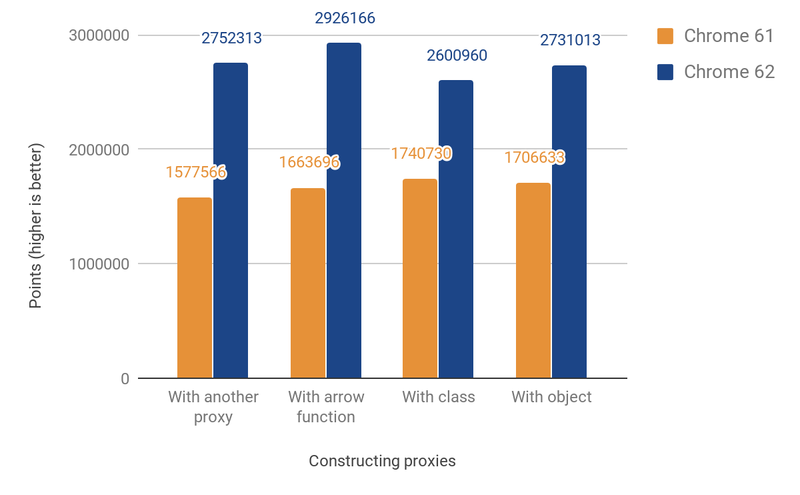 Our original C++ implementation here followed the EcmaScript specification step-by-step, resulting in at least 4 jumps between the C++ and JS runtimes as shown in the following figure. We wanted to port this implementation into the platform-agnostic CodeStubAssembler(CSA), which is executed in the JS runtime as opposed to the C++ runtime.This porting minimizes that number of jumps between the language runtimes. 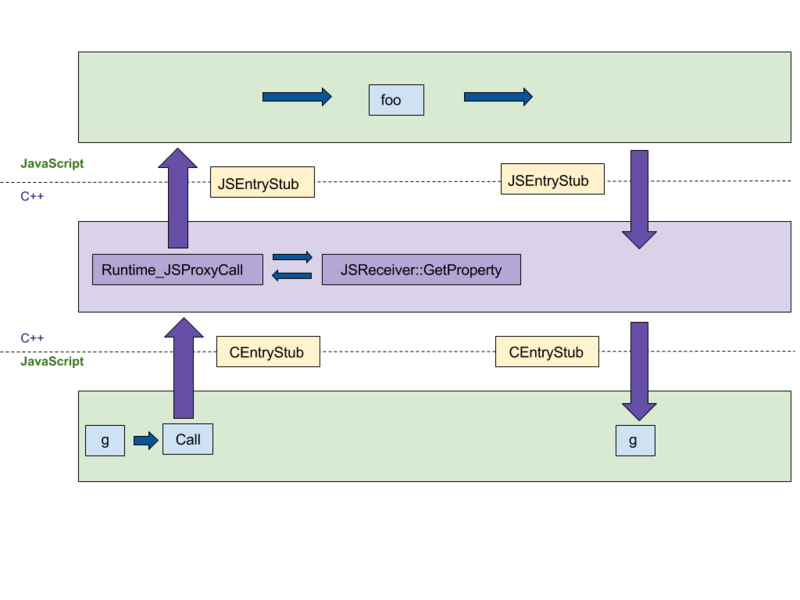 CEntryStub and JSEntryStub represent the runtimes in the figure below. The dotted lines represent the borders between the JS and C++ runtimes. Luckily, lots of helper predicates were already implemented in the assembler, which made the initial version concise and readable. After porting the trap execution to CSA all of the execution happens in the JS runtime, reducing the number of jumps between languages from 4 to 0. 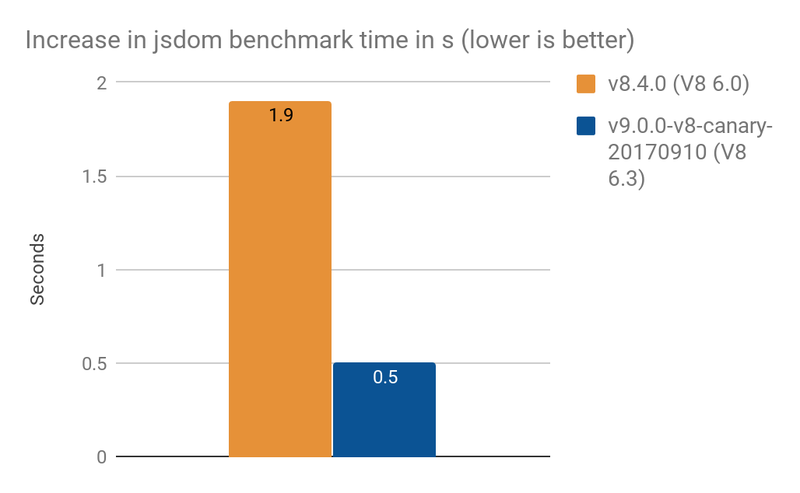 Our JS performance score shows an improvement between 49% and 74%. 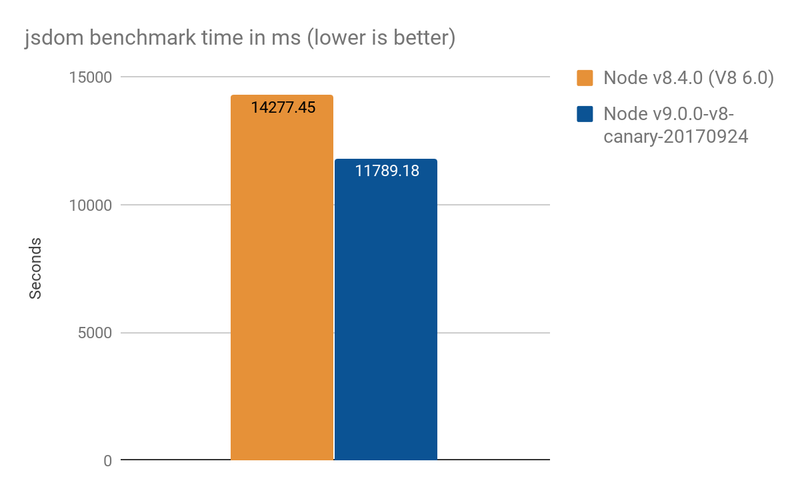 This score roughly measures how many times the given microbenchmark can be executed in 1000ms. For some tests the code is run multiple times in order to get an accurate enough measurement given the timer resolution. The code for all of the following benchmarks can be found in our js-perf-test directory. 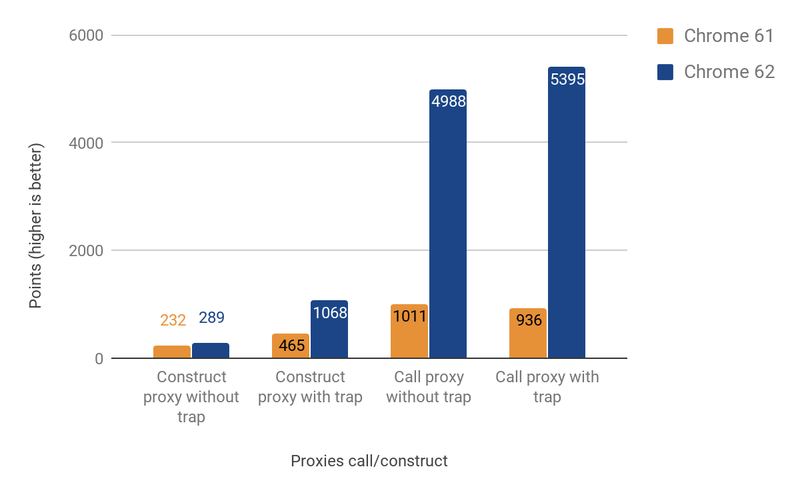 The next section shows the results from optimizing call and construct traps (a.k.a. “apply” and “construct“). It turned out most of the time is spent in NewObject and the functions called by it, so we started planning how to speed this up in future releases. 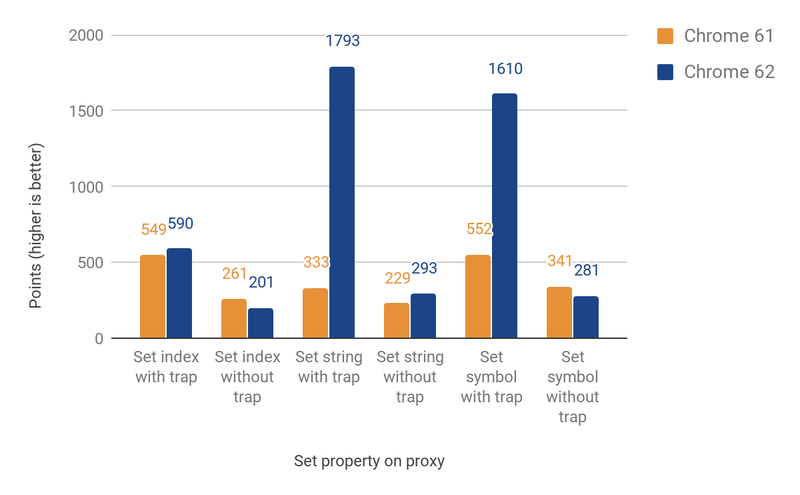 The next section describes how we optimized the other most common operations — getting and setting properties through proxies. 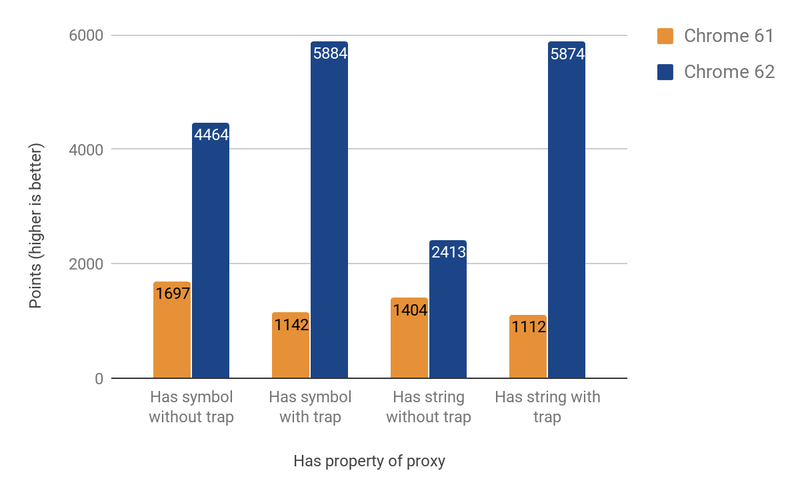 It turned out the gettrap is more involved than the previous cases, due to the specific behavior of V8’s inline cache. For a detailed explanation of inline caches, you can watch this talk. 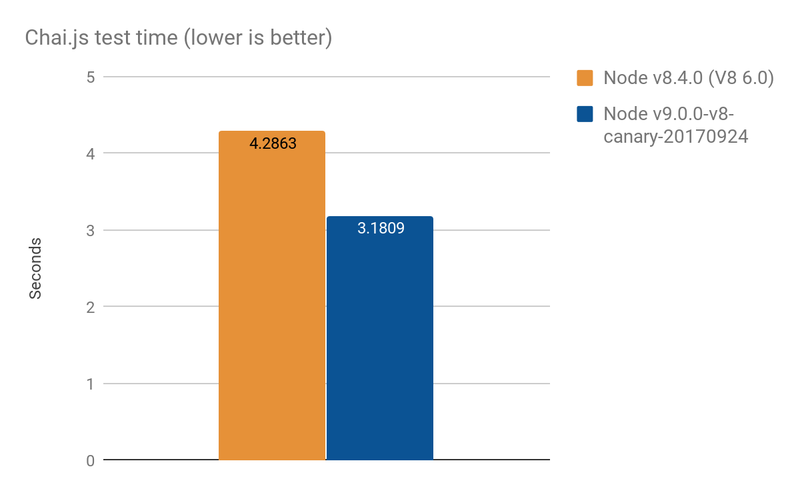 After landing the change, we noticed the size of the Android .apkfor Chrome had grown by ~160KB, which is more than expected for a helper function of roughly 20 lines, but fortunately we track such statistics. It turned out this function is called twice from another function, which is called 3 times, from another called 4 times. The cause of the problem turned out to be the aggressive inlining. Eventually we solved the issue by turning the inline function into a separate code stub, thus saving precious KBs – the end version had only ~19KB increase in .apk size. The next section shows the results from optimizing the hastrap. Although at first we thought it would be easier (and reuse most of the code of the get trap), it turned out to have its own peculiarities. A particularly hard-to-track-down problem was the prototype chain walking when calling the in operator. The improvement results achieved vary between 71% and 428%. Again the gain is more prominent in cases where the trap is present. This approach can be applied to any general optimization task that you may have.